Once the largest chain of retail stores in the U.S., Sears lost market share to upstarts Walmart, Best Buy, Home Depot, and later Amazon through poor decisions, mismanagement, and arrogance. Once the largest sport in North America by annual attendance with a monopoly on wagering, racing, too, has lost market share to state lotteries and has been dwarfed by the NFL, MLB, NBA, and NHL. The list of reasons this has taken place is unable to be covered in this space. Consumer habits evolve and change over time. Businesses must adapt, innovate, and reinvent themselves to keep pace. Few can say racing has been on the cutting edge over the last few decades. Ten years from now—perhaps as few as five—the sport might look back to see that March 14, 2019, was a day the sport made a crucial pivot in the right direction. Early in the day U.S. Representatives Paul Tonko (D-N.Y.) and Andy Barr (R-Ky.) introduced the Horse Racing Integrity Act, a similar version of the Horse Racing Integrity Act of 2017. In a nutshell, the bill “provides for the increased safety and welfare of horses, jockeys, and drivers” through a “conflict-free, self-regulatory organization responsible for creating and implementing an anti-doping program for the entire horse racing industry.” A key requirement is the ban on all medications within 24 hours of a race. Later in the day The Stronach Group, which owns Santa Anita, along with other tracks, such as Gulfstream Park, Laurel Park, and Pimlico, went a step beyond by announcing a zero-tolerance policy for race-day medication at its California tracks of Santa Anita and Golden Gate Fields. The bold move to follow International Federation of Horseracing Authorities standards includes a host of additional measures to insure safety and transparency. An agreement with the Thoroughbred Owners of California to ease into a ban on Lasix, or Salix, beginning with 2-year-old racing in 2020 allows horsemen to plan for the future better. Many took the “ripping the Band-Aid off” the medication issue as a step too far, a knee-jerk reaction to the breakdown situation. We disagree. The status quo hasn’t worked for some time and the sentiment toward animal welfare is becoming paramount. 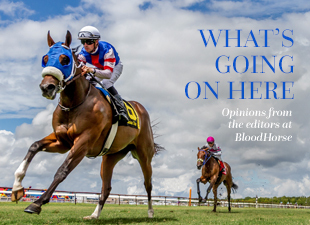 Individual racetracks can do everything possible to insure a safe racing surface, but the future livelihood of racing relies upon “coming clean” on race-day medication. North America houses the only racing jurisdictions on the planet that allow race-day medication. Royal Ascot, Arc weekend, the W.S. Cox Plate (G1), and Melbourne Cup (G1) festivals in Australia are all run Salix-free. The March 10 Longines Gran Premio Latinoamericano (G1) at Club Hipico in Chile offered a scintillating result while run Salix-free. The situation at Santa Anita is beyond painful and dire. However, we must look at the bigger picture, imagining where the sport needs to go in the not-so-distant future. The “30,000-foot” view requires a concerted effort to make Thoroughbred racing better and more viable and accessible to the American public. Doing away with training-day and race-day medication will pivot the sport in the right direction.